A-level Further Mathematics is designed to broaden and deepen the mathematical knowledge and skills developed when studying A-level Mathematics. It may be studied alongside or after taking A‑level Mathematics and provides a stimulating experience for those who enjoy the subject. A-level Further Mathematics is made up of six units. 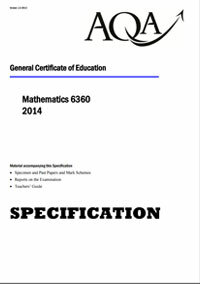 Many combinations of units are allowed for AS and A-level Further Mathematics. There are four Further Pure units available and any of the applied units listed for A‑level Mathematics may be used towards A-level Further Mathematics. There are additional Statistics and Mechanics units available only for Further Mathematics. The four Further Pure units build upon the techniques in Algebra, Geometry, Trigonometry and Calculus developed from the Pure Core units as well as introducing topics such as complex numbers, matrices, proof, hyperbolic functions, polar coordinates and differential equations. Mathematical applications make up the remainder of the qualification and there are various options to suit the needs of individual students. Decision – networks, algorithms, sorting, linear programming, mathematical modelling. Mechanics – forces, energy, motion, kinematics, projectiles, mathematical modelling, moments, collisions and stability. Statistics – probability, data handling, probability distributions, estimation, correlation and regression and hypothesis testing. Students can focus on one strand or study a mixture of the three. All units are of equal weighting and are assessed by an exam of 1 hour 30 minutes available in the June series. Statistics 1 has optional coursework worth 25 per cent of the unit with an accompanying exam of 1 hour 15 minutes. Studying both A-level Mathematics and A-level Further Mathematics provides a foundation for further studies in any Science or Maths-based course, ranging from Computer Science, Medical Sciences, and Psychology to Statistics, Management and Actuarial Science.